Surly -- Adj; bad-tempered, unfriendly. Probably not the best name for a brewpub. Don't know about you but I don't want to anticipate being treated by a surly wait-person as I ask for a favorite brew. But then when you've changed the laws in a state to suit your brewing & beer needs and the desires of your patrons, I suppose you've earned the right to puff up your chest and be a bit....well, surly. But no worries here. 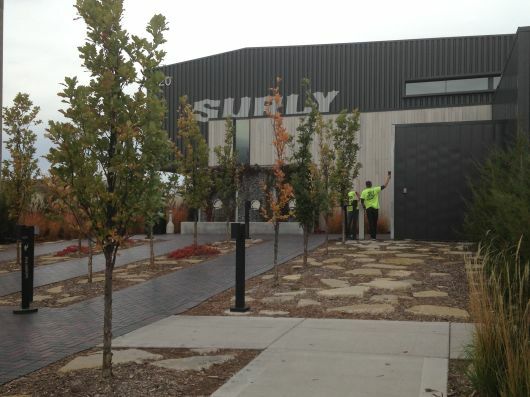 The folks at Surly Brewing are as pleasant as can be, even on a cold, windy Minnesota afternoon. Wife Persimmon & I meet friends for a beer (or 3) on our travels throughout the USofA. Although not beer drinkers, they knew we were and suggested the place. Sitting outside in the expansive beer "garden" was a bit challenging but the beers warmed us up thoroughly. 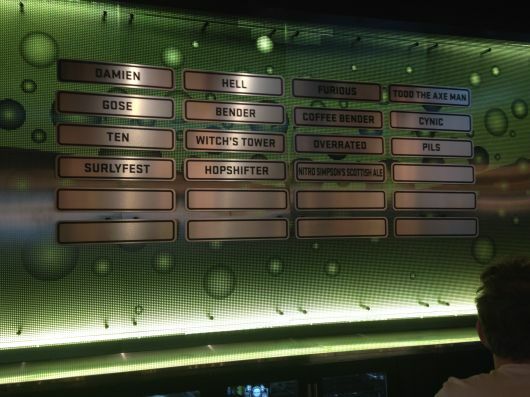 15 on tap, a good variety but I was particularly aware of their signature brew; an elusive little darling known as "Darkness." This is one of those special releases, once every year, that when the day arrives, beer geeks everywhere salivate. However, having been on the road for 2 months, the day had escaped my attention. Not, however, my alert sons who informed me that Darkness was released in October. As we sipped, I excused myself, jumped online and discovered "the day" was in October...the 15th to be exact which just happened to be...the day before!!!! Are you kidding?? I missed it by a day?????? But the Universe was watching over me and my ex-lawyer friend started asking those lawyer-type questions and determined that, yes indeed...the release day was the day before -- however, the bottled Darkness would begin showing up in stores the next morning, Monday. So we downed our Coffee Bender (cold coffee, delicious) and our Witch's Tower and headed off to St. Paul for dinner. It was an early night. I had a mission the next day. We arose at 7:00 am because we had been informed the beer would be arriving when the local liquor store opened at 9:00. Having been at this game for awhile, I knew I needed to be near the front of the anticipated long line. A quick 5-minute drive and we were indeed at the head of the pack....the non-existent pack. "Well," I thought, "perfect. My bottle is guaranteed." Then we noticed that the store opened not at 9:00 but 8:00, only moments away. "Hmmmm," I pondered. "Why are we the only ones here? Don't Minnesota beer geeks know about this? Or do they have some special pusher-man to home-deliver Darkness?" Regardles, the doors did indeed open on time at 8:00 but, when asked, the guys said "Nope, no delivery yet." Damn. "But," he said, "give me your number & I'll call you when it arrives." Long story short; we went to breakfast and almost 4 hours later, my phone rings - it's Dustin telling me the beer was there. Another short 5 minute drive and I'm the first to buy. One man is behind me. That horrendous line never materialized. Why? Don't know. Minnesotans certainly know about Darkness and mark its release date on their calendars but unlike some other special releases in other states (can you hear me Colorado? California?) there is plenty to go around. True, I was only allowed 1 bottle but wife Persimmon also bought one...and a good friend, who just happened to know a fella who ran a liquor store, was able to acquire 2. So I left Minnesota a happy man; 1 bottle each to 2 sons, 2 bottles for my-own-self and 2 bottles shared with that special beer "mule." All of this is just to praise Surly Brewing and their incredible brews. Surly has helped put Minnesota on the map for craft beer in a very short time, becoming the rock-stars of brewing. I appreciate this and I really like their beers. This is one of the few breweries that is really tough to get in to. You have to book your tours months in advance and have some stiff competition...so good luck to you! On the other hand, Surly has several festivals each year, that make it more available: Darkness Day is the Fall release of their limited Darkness Imperial Stout--folks stand in line overnight for this, drinking beers and camping out in the parking lot. 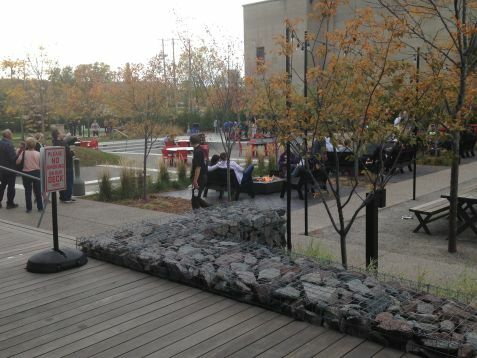 Surlyfest is the Octoberfest offering with cheaper beers, music and food...as well as access to the brewery. They also hosted an AHA rally for homebrewers and gave out 5 gallons of unfermented Surly beer for us to take home in 2009. 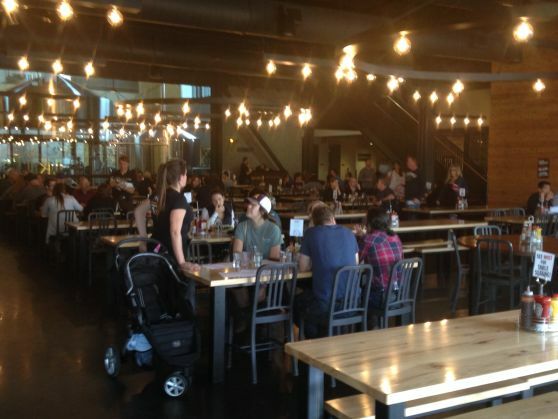 The brewery itself is located in an old industrial building in the sleepy suburb of Brooklyn Center. They do have a nice tasting room with a TV and tables. The beers are always fun, and there is something for everyone. Furious is the flagship beer, a very, very hoppy IPA. Bender is a nice American Brown ale that goes great with a lot of foods. Seasonals such as Smoke, and teh yearly anniversary beers are in high demand. the tour consists of signing up at their website to attend their friday tours (6-8ish) you go there, show your id, get a you get a wristband with 5 tabs on it and that entitles you to 5ish samples, more if there are samples left over after the tour. 4 styles of beer were available for sampling at the time of my tour. The main tasting room has a standing tap off the store... there are bathrooms here as well... the brewery is thru one of three doors, that is the next part of the tour. Taking you out into the brewery, the brewing, canning, trials and tribulations and future projects (depending on the tour guide) are hinted at, explained, and told in story form. The brewery is all 100bbl tanks, and has a lot of room for expansion, something that most younger breweries do not have... noticing the floors are slanted toward trench drains is something that in my opinion is key for any brewery and being that the floors were redone to attain this is awesome. We were urged to go and grab a beer if we ran out during the tour and resume in with refreshment when needed. Surly beer is just okay with their seasonals being better then their standby's... tho the furious is good, but that's just my opinion. 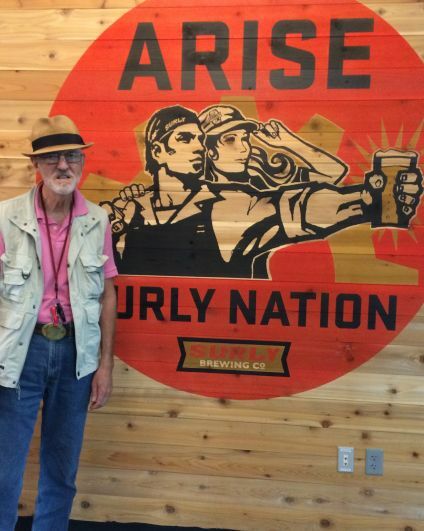 Once you drink a Surly Beer you will be hooked. They have a beer for everyone. Furious is a very hoppy beer. This next line comes from their web site and sums it up best. Four American hop varieties are used at a rate of over three pounds per barrel. The result is a rich malt sweetness infused with bright hop flavor and aroma from beginning to end. Oh yeah, it's about 6% alcohol and around 100 IBUs. Bender-This beer is an amalgamation of styles; brown/porter/apa. Five distinct malts, including two from Belgium, give this beer added complexity and depth. These 2 are the main brews but they do release others throuhout the year. Right now you can buy Surlyfest Beer.